From the Greek mainland ferries and high speed catamaran services run daily from Piraeus and Rafina. The journey between the port of Piraeus (Athens) and Mykonos takes between 4h 30min and 5h 15min, depending on the type of ferry you are taking. Most of the ferries connecting Piraeus to Mykonos stop working by end of October and resume by April. Mykonos can also be reached directly from other islands in the Cyclades. There are boat connections from Syros, Andros, Tinos, Paros, Naxos, Ios and Santorini, Crete, Rhodes, Chios Lesvos, Samos and Ikaria. 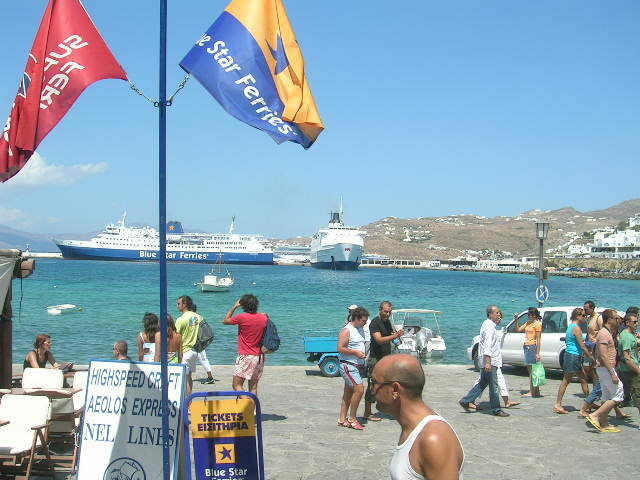 Mykonos has two ports: the old port in Mykonos Town, and the new port at Tourlos, about 2 km north of Mykonos Town. Check before you travel which port your boat will use. Mykonos has an airport , about 4km away from the main town. There are daily flights from Athens airport (35 minutes) by Olympic Air and Aegean Airlines. In high season there are also less frequent flights from Rhodes, Santorini and Crete (Heraklion) by Sky Express.